Cosmetic Dentistry, Engima Cosmetic Dentures - the secret behind natural looking cosmetic dentures. What makes natural teeth look so natural? dentures the brain registers that something is missing. denture the true cosmetic option. crystalline structure and adds depth to the tooth. Natural teeth seem to subtly change as the head moves. seen in different positions in one or two teeth in each set. cosmetic dentures available for your patient. the mouth. Enigma teeth are truly a significant advance. 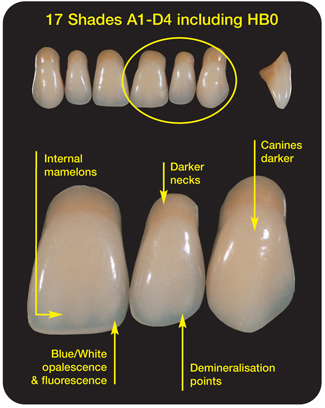 laboratory to individually colour the base to harmonize with the patient's gums. Examples are shown in the photos here.